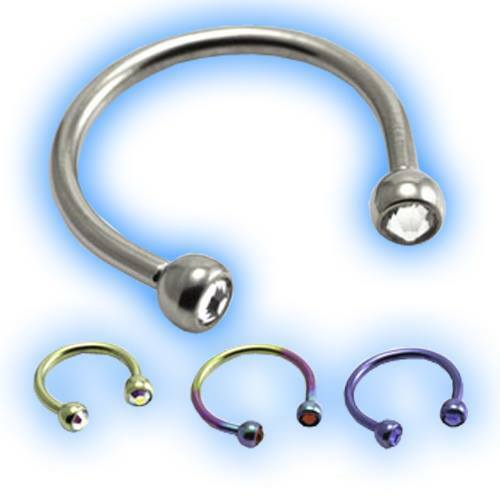 15 Titanium and 17 gem colours to choose from! These micro circular barbells (or CBB / horseshoes) are made out of Grade 23 solid Titanium and have 2 removable 3mm gem balls. The material is 1.2mm (16 gauge) thick and they are available with internal diameter measurements of 6mm, 8mm, 9mm, 10mm or 12mm. They can be ordered in either Highly polished (silver), bronze, brown, blue, ice blue, yellow, pink, purple, 2 tone purple blue, 2 tone purple green , green or rainbow with a choice of 17 different Swarowski Crystal gem colours.